Sure, it’s quick and easy (and let’s face it, undeniably fun) to drop a bundle at the nearest furniture or bed ‘n’ bath shop on a bedroom makeover. Unfortunately, that’s just a pipe dream for most of us, who must count our dollars carefully and have little to spare for decorating upgrades, however much needed. So here are ten easy ways to give your bedroom fresh style without spending a dime. The trick is to be creative and use what you already have. Choose one suggestion, choose them all; you’ll be sleeping pretty tonight in your improved space. The fastest and easiest way to make your entire bedroom look better without spending any money is simply to make the bed each morning. You say you don’t have enough time? Not a good excuse–in less than one minute, you can straighten the pillows and pull up the sheet and comforter. 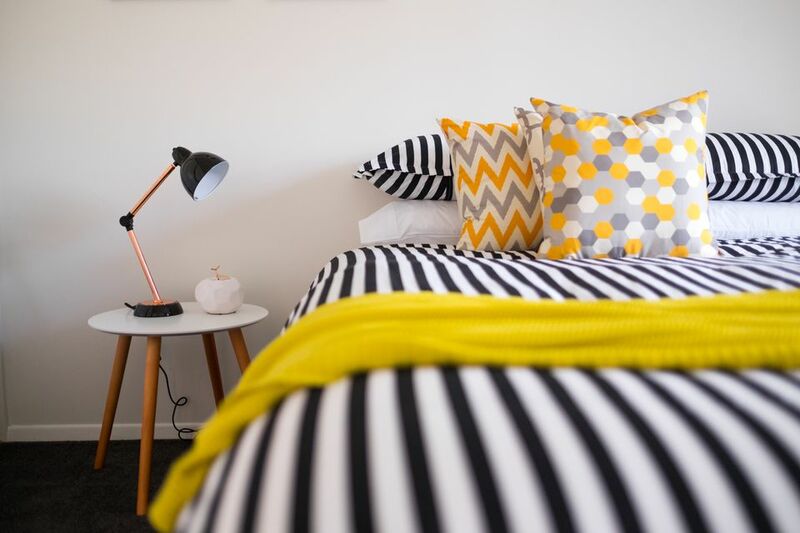 Instantly, your room seems cleaner, more organized and more attractive; plus, starting your day by making your bed paves the way to a more productive day overall. Vacuum the entire room, including under the bed and inside the closet. If you have wood, laminate or tile floors, mop. Dust your furniture and collectibles. Don’t forget picture frames, lampshades, and ceiling light fixtures. No clothing on the floor, the foot of the bed, or the armchair: hang it up, put it in a drawer, or toss it into the laundry hamper. “A place for everything, and everything in its place.” Return anything that doesn’t belong in your bedroom to its proper home. That means dishes to the kitchen, paperwork to your home office or desk, read magazines to the recycling bin, and exercise gear in a bag near the door, where you’ll remember to grab it on your way out. If you don’t love it, it doesn’t belong in your bedroom. Gather up clothing that doesn’t fit or you never wear, collectibles that add nothing but dust to the space, and anything else that isn’t either useful or beautiful, and donate it all to the charity of your choice. Who says the only furniture that belongs in the bedroom are pieces labeled as “bedroom furniture” by the manufacturers? You can create nearly an entirely new bedroom set without a single piece of “bedroom furniture,” and at zero cost. All you need to do is shop around your home (or the homes of family or friends) for items that can be repurposed into a new life in the bedroom. The easiest pieces of furniture to swap out for alternatives are your headboard, nightstands, and footboard. Decorative fencing, old shutters, antique or interesting doors, a folding screen, a row of wooden oars, or a woven gathering of twigs and branches all work in place of a traditional headboard. Check out your basement or garage for possibilities. Instead of a footboard, repurpose a small desk, bench, trunk, or ottoman from the living room. If your bedroom is small and already furnished only with the bare necessities, this isn’t an option, but for those lucky enough to have a sizable room, there are often pieces of furniture or accessories that really don’t need to be there. If you put on your makeup in the bathroom, do you really need a vanity in the bedroom? If your book collection has dwindled, or you prefer to do your reading in the living room, perhaps you can move the bookcase to a new spot. Look around the space, and then decide on at least one item that can either be moved to another area of the house or sent to the Goodwill. The result will be a room that’s more open and airy – attributes that just about everyone appreciates in their bedroom. No, not your bed pillows, but if the throw pillows on your living room sofa match your bedroom’s color scheme (or if they work as an accent color) go ahead and mix things up by swapping them with the throw pillows on your bed (if you don’t have any throw pillows on your bed, now you do.) Bam, your bedroom just got a mini makeover and it didn’t cost a cent. That big picture over your couch and the big picture over your bed? Swap them. That gathering of small pictures in the dining room? Use them to create a gallery wall over the dresser or headboard, and replace them with the artwork that was previously in your bedroom. You get the idea–moving artwork into different rooms not only gives your bedroom a fresh new look, but it also does the same for the rest of your home. A win all around! Far too many dresser tops serve as little more than repositories for folded clothing that should be inside the drawers, jewelry that belongs in a box, books that missed the bookshelf, and bedtime-snack dirty dishes that really ought to be in the sink. Add Pinterest-worthy style to your bedroom by clearing away all those eyesores, and instead, styling your dresser top like a pro. Set a tall lamp, houseplant, jewelry box, or piece of artwork propped against the wall–not hung–on one side of the dresser. On the other side, position two or three items that are varied in height, but shorter than the tall item you used in step one. Houseplants, framed photos, jewelry boxes, or small collectibles all fill this role nicely. In the middle of the dresser top, set out your prettiest tray–if you don’t have one in the bedroom already, commandeer one from the living room or kitchen–and use it to corral small items like perfume bottles, jewelry, or tiny knickknacks. Every bedroom deserves a bouquet of fresh flowers. What better way to add a shot of color, life, and beauty to the space? But flowers can be expensive; even those supermarket bouquets typically cost more than $10, which adds up quickly if you are replacing them each week. Instead, head to your backyard (or, with their permission, the yard of a friend, neighbor, or family member) and clip a bouquet of pretty blooms from your own garden. If blossoms are in short supply, perhaps you can gather up interesting twigs, colorful leaves, or fallen seedpods in their place. Want to shake things up without breaking out your credit card? If you have mismatched nightstands flanking your bed (there is no real reason nightstands have to match, after all), then switch them with each other. You’d be surprised how much of a difference even a small change like that can make in your room’s appearance. If you have an upstairs bedroom, you might have to skip this step for safety’s sake, but if your windows are safely within reach, break out the cleaning supplies and scrub them until they sparkle both inside and out. Think this admittedly tedious job won’t make a difference? Then stop and consider; have you ever seen a gorgeous bedroom in a decorating magazine with filthy windows? Does Your Bedroom Have a Big, Empty Wall? Here's how to Decorate It.